This ideas competition hits many of our buttons. Drylands Design seeks innovation in architecture, urban design, landscape architecture, regional planning, and infrastructure design that addresses water supply, water quality, water access, water treatment, and the water/energy nexus. 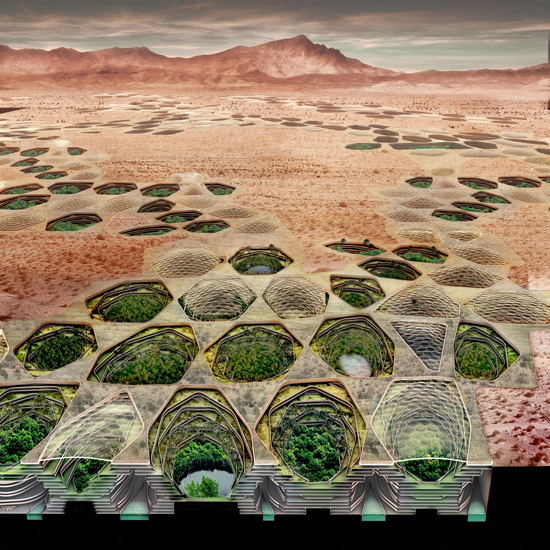 Drylands Design seeks integrative proposals from multidisciplinary design teams that anticipate science and policy perspectives as necessary dimensions of intelligent design response, and exploit beauty as an instrument of resilience and adaptation. Registration ends 15 November 2011, and entries are due 15 December 2011. It's worth noting, meanwhile, that one of the organizers, the Arid Land Institutes, recently hosted a series of lectures that showcased contemporary design strategies for managing water scarcity in arid landscapes. At the institute's Vimeo account, you can watch Katherine Rinne's talk on the 3,000-year history of water infrastructure and urban development in Rome (Part 1 and 2); Morna Livingston on Indian stepwells (Part 1 and 2); and Aziza Chaouni and Liat Margolis on their Out of Water project (Part 1, 2 and 3), a traveling exhibition that included the above speculative project, Sietch Nevada by Matsys. Nan Ellin's talk hasn't been uploaded yet, but you can still read about the canalscape of Phoenix, Arizona, online.